Cold outreach is a fantastic way to build new relationships or secure new leads. But cold outreach alone isn’t enough anymore. Sure, it might help you land a few new leads or build some new relationships, but using it as a closed loop is a bad idea. It limits your potential. Limits your return on investment and the revenue you could have generated from it. User behavior isn’t meant for a single touchpoint in the modern world. Consumers bounce from social media to emails to webinars and e-books before even considering buying from you. Simply expecting a cold outreach target to jump on the phone and give you their hard-earned money is a limiting strategy. You need something to take your outreach strategy to the next level. To keep those cold outreach targets interested and coming back for more. Educating them is the key. Today I’ll show you how to integrate paid ads to skyrocket the success of your cold outreach campaigns. Once you’ve performed the first step in the outreach process, you need some ammo to keep adding fuel to the fire. Odds are, you won’t land a call with your outreach target after the first or even second email. Why? Because they don’t know you yet. They aren’t brand aware, meaning they have no clue what your company does and how you can benefit them. The critical factor of any businesses success is solving a pain point. But you can’t solve that pain point for a user if they aren’t clear on what your business does. Educating the potential customer by building brand awareness. The customer needs to know what your company does, how they do it, and most importantly, what’s in it for them. What do they get from the experience? That’s where typical cold outreach falls short. You don’t have enough time or space to explain it all. And getting them on the phone before they’ve become brand aware or educated on your business is a crap shoot. It likely isn’t going to happen. But that doesn’t mean it’s off the table. There are a few sneaky ways to use paid ads to accomplish this goal on the side without forcing them or bombarding them with content from your email campaigns. One of the best ways to do it is by turning your email list into a custom audience on Facebook. This will allow you to deliver ads to your cold outreach targets to educate and build brand awareness during the outreach process. Meaning you can drive them down the funnel faster and more effectively. From here, you want to create a new custom audience. You’ll base the custom audience on your cold outreach email target list. If you have emails, phone numbers, zip codes and more, feel free to throw those in. 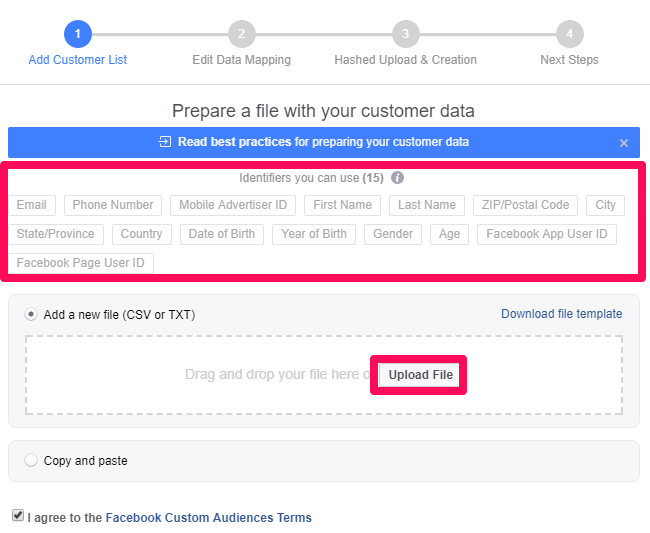 Once you’ve saved your list, Facebook will match your list to the existing Facebook accounts of your targets. Now, it’s time to create the ad. Remember that this entire stage of the buying journey is focused on building awareness of your brand and educating the lead on how they will benefit from working with you. One of the best content types for this exact goal is case studies. It shows what your company does, what processes and methods you took, and what common problems you solve. It works as a form of social proof by showcasing how other real clients have benefited from working with you. It puts hard numbers in the mind of the potential customer. This is the perfect form of educational content that builds brand awareness. It’s effective because there is absolutely no downside to the lead downloading it. 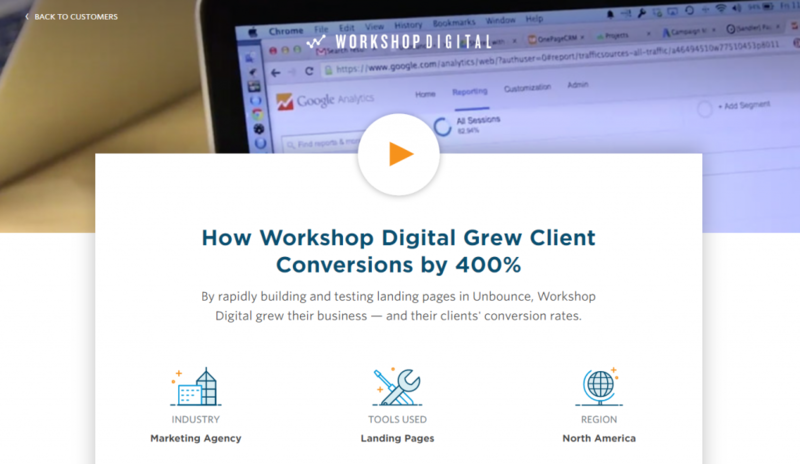 Unbounce eliminates the risk by offering it for free, no questions asked. Users at this stage of your cold outreach campaign aren’t going to buy from you. People make a big mistake when they go for the sale too early. The key here is education and getting the customer to realize that they need your services. This ad is a great example to tailor your own case study ads to. The headline is also very powerful: How Leading Brands Succeed With Unbounce. It’s simple and gets straight to the point: Unbounce can help you. No need to submit emails or fill out forms because you already have their email. This would only reduce your visits/click-throughs. There is virtually no risk, and this type of content can really help a user grasp the impact your company has. This will show them that it wasn’t a one-off, lucky case. And it will come in handy for remarketing these users later. To make this tactic more impactful, send another follow-up email to your list that talks about the case study. Reinforce it with the email to generate even more traffic to the study. Once you’ve done this, it’s time for the next piece of the pie. We all know that the buyer’s journey is painfully long. Leads take weeks and even months to convert to a real sale. The typical funnel process is proven. Users simply won’t convert if they aren’t ready. And a large part of that perceived “readiness” involves education and engagement with your brand. When was the last time you walked into a store you’d never heard of and bought the first item you saw without reading about the company or understanding what they do? Now that you’ve taken the first step and delivered ads for a case study to your outreach list, it’s time to bring back those interested leads for more content. This time, we’re going to create a remarketing list. This will allow us to remarket engaged visitors from those specific landing pages in the first ad. This will be the same URL you directed people to in the first ad. This audience in and of itself will be great, but if you want, you can always get more specific. 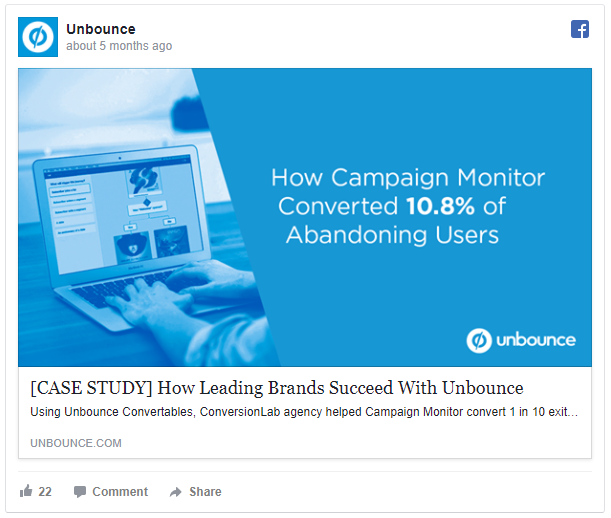 Remember how Unbounce had multiple case studies at the end for users to read as well? 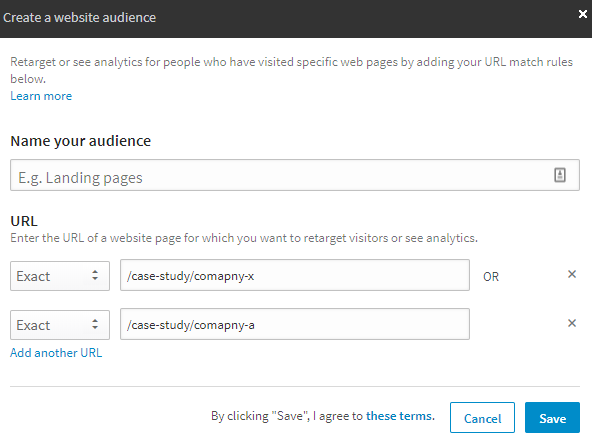 You can now target users who were so interested that they took their own time to read another case study! Save both of these custom audiences. Now let’s head to LinkedIn to create another audience. LinkedIn is great for switching it up. Users might get burnt out on Facebook. They might get sick of your ads. LinkedIn is yet another amazing medium for reaching your targets. Save your new custom website audience on LinkedIn, and now it’s time for the ads. But before we jump into the ads, let’s recap on where in the funnel these audiences are likely to be. This will help you decide what ad style to go with for maximum ROI. 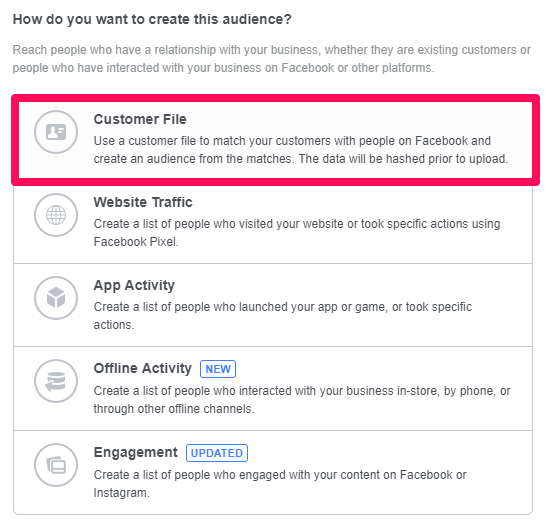 The first audience you created consisted of users who visited your first case study landing page by clicking on your initial Facebook Ad. These users didn’t visit any other pages, so they’re likely a little less warm. Meaning they aren’t as brand aware or interested as the second group you created that visited multiple pages. So your offer needs to be less demanding. For the single landing page audience, focus on creating an ad with video content. The video content can be anything from a business explainer to a case study in video form. The goal with the first audience is to educate them more. Video content performs very well on Facebook, which will help you drive more visits and engage your least engaged audience. Now, for the second audience you created – the one where you targeted visitors who hit your original landing page and another case study page – we can get more actionable. These users are hot. They’re engaged. Eager to learn more about you. For this audience, you want to drive them to sign up for a free webinar. A webinar will help to educate them further but focus more heavily on the transition from lead to sale. It’s video-based and focuses on the goal of driving webinar visits. Plus, they tailored the text-based content of the ad to perfection. Does your team find it difficult to deliver projects on-time and within budget? 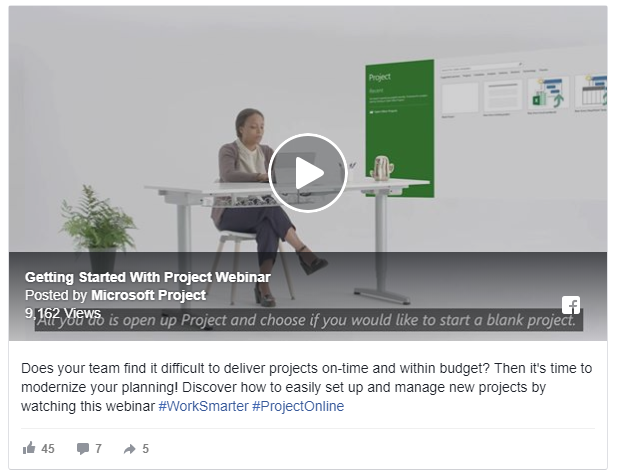 Discover how to easily set up and manage new projects by watching this webinar. They address the pain point and deliver a swift solution that still has a relatively low threat or commitment level. They don’t have to pay anything or give anything up. These remarketing audiences will help you turn cold outreach prospects into sales faster than you could have imagined. You don’t need to sit there emailing back and forth waiting for them to take action. Bring the action directly to the outreach target with education-based ads that focus on building brand awareness. These ads will help the outreach target understand how your business can help them without the threat of a phone call or giving up information. Want to increase your cold outreach ROI? 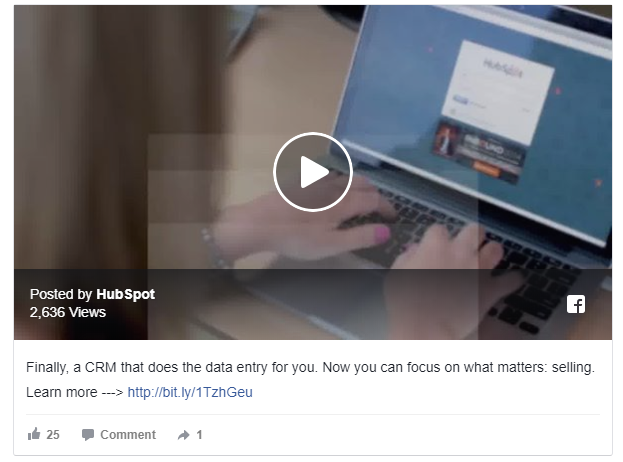 Tap into Facebook and LinkedIn ads and remarketing to keep them in your funnel and interested in your company. Cold outreach is an amazing way to land new leads. Countless companies and entrepreneurs have found massive success from hitting the grindstone and simply contacting new leads. But nowadays, consumer behavior is different. People go through an extended buyer’s journey that doesn’t allow for fast conversions after a few emails. They want more. More information, more experiences. Meaning you can’t sit back and hope that your cold outreach email converts a user. Instead, start thinking of your cold outreach strategy as a funnel. Draw them in with cold outreach, and then tailor your ads to their pain points. Be sure to create low-risk ads that direct users on your cold list to case studies with the goal of educating them. Next, remarket the interested users and bring them back to your site for another video or webinar based on their behavior. Finally, move in for the close after you’ve educated your leads, and watch your cold outreach ROI skyrocket. Cold outreach is great, but producing a high ROI from your cold outreach requires multiple touchpoints and a combination of strategies for optimum success. I wanna buy g mass with g suite package so can you tell me how to warm up g suite or g mass account to use its maximum limits . Warming up an account is basically using your account to send and receive emails. Sending smaller campaigns over time to establish a reputation for the account and the domain, if you’ll be using your own domain for your email. We don’t want your behaviors to flag Google’s spam detectors and cause bigger problems for you down the line. Since GMass does not have a limit, you can use it up to Gmail’s Google imposed sending limits. To learn more about these limits and factors here: https://www.gmass.co/blog/how-many-emails-can-you-really-send-with-gmass-and-gmail/.